He is only 32 years old but very energetic & a good source of knowledge. He is Graduate in Computer Science. He has been the follower of Lord Krishna since then he was a student of X class. 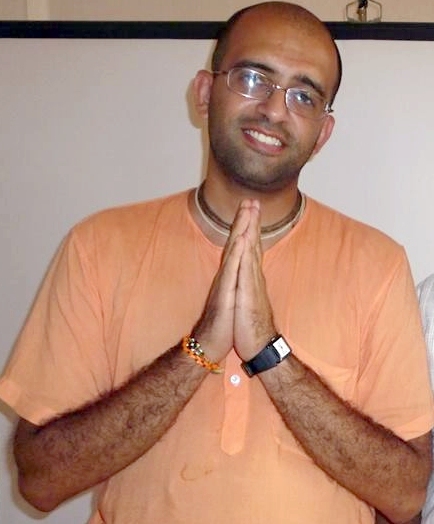 He joined ISKCON 13 years ago. Now, he is the Vice President of Dwarkadhish Temple located in Sector-13, Dwarka. Yes, he is Amogh Lila Das who is heading the said temple. He started reading & learning Holy Gita thoughts since his early childhood. He is very good preacher and able administrator. According to him, “Lord Krishna can bring happiness & peaceful atmosphere within us and our surroundings, if we really follow his holiness.” He further added that they have regular weekly session of two hours on Saturday(in Hindi) & Sunday(in English) from 7.30 p.m. to 9.30 p.m. Apart from this, there is another four days special session. Actually, it is a Life Changing Seminar-an ultimate solution for everyone. On first day the theme is “Search for happiness” , second day “Does God exist? If yes who is he?”, on third day it’s “Why bad things happened to good people” & on fourth & concluding day the most important topic is discussed with a round of direct interaction that is “Practical application of Bhagvad Gita.” The message of happy/peaceful living, , Dwarkadhish Temple. The message of spirituality & peaceful living besides respect for every religion is being spread among the residents of sub city & even in all institutions under the kind guidance of him.